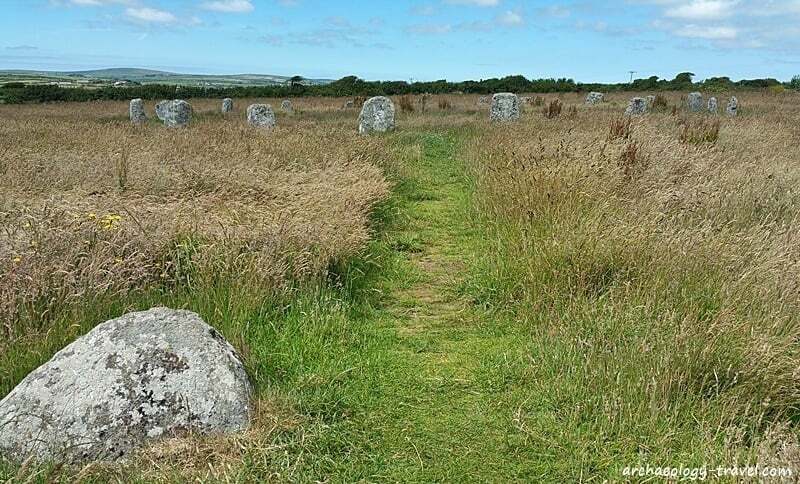 South west of Penzance, and not that far from Cornwall’s Land’s End, is a restored, Neolithic stone circle known according to native folklore as the Merry Maidens. Nineteen stones made using local granite form a perfect circle. The stone circle is one of a number of ritual and mortuary features on this prehistoric landscape, that is easy to visit whether on foot, in a car, or using public transport. Merry Maidens turned to stone. Driving through the narrow lanes of Cornwall this week, the news on the car radio was dominated by the UK Government’s Budget announcement on Wednesday. One of the features of the budget that got quite a bit of attention prior to the Chancellor’s presentation in the House of Commons on Wednesday was the matter of Sunday trading. There seemed to be endless debates on news and consumer programmes arguing the pros and cons of allowing shops to trade on Sundays in England and Wales. So it was with great delight that I coincidentally read about and then went to see the Merry Maidens near Penzance. No, this is not a domestic version of the Pirates of Penzance. The Merry Maidens is a Neolithic stone circle; a perfect and complete stone circle that is just one prehistoric element within a landscape that has a range of ritual and funerary monuments that included burial mounds, standing stones, and at least one other stone circle. View from the south, and the outlying stones. Today there are 19 stones in all, arranged in a perfect circle that is about 24 metres in diameter. Each stone is placed three to four metres apart. A few metres away from the circle to the south are two large stones in the ground, one of which is slightly raised. The megaliths in the circle, all made from locally sourced granite, are graded in height with the tallest at the south-south-west end. The tallest stone is about 1.4 metres high. Although clearly in a good state of preservation, the stone circle has been restored. This work took place sometime between 1862 and 1869. Recent research by the archaeologist John Barnatt suggests that the circle’s perfect appearance is more likely to be the product of this restoration. Barnatt believes that there were probably 18 not 19 stones. 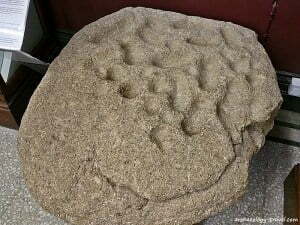 There is also the possibility that not all the stones are original, and that some of the old stones were moved to give the circle its perfect appearance. While I was walking around the site, a number of people visited the stone circle. 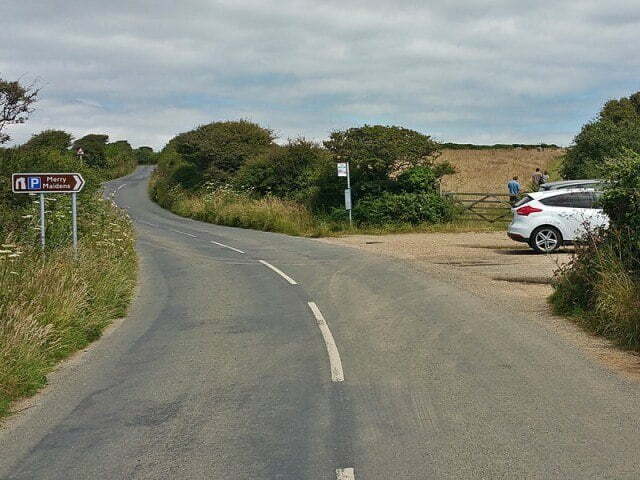 They would arrive, get out of their car and walk up the slight incline to the centre of the circle, take a few photographs and then return to their car and leave. Unfortunately, there is no information panel at the car park to inform people of the other features of this ritual landscape. And general regional guidebooks only mention the stone circle, with a few mentioning the standing stones. They leave none the wiser. The Merry Maidens was first described in 1769 by the antiquarian William Borlase. He noted that between the burial chamber and the stone circle we see today there was another stone circle. Later in 1872 one of his descendants, William Copeland Borlase, noted that of this second circle seven stones were still standing. Unfortunately, the circle seems to have disappeared entirely by the end of the 19th century. 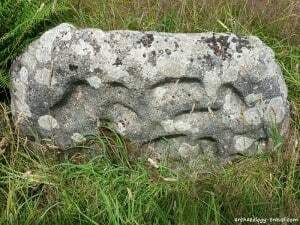 The roadside Tregiffian burial chamber, showing the kerb stones in an arc, the decorated jambstone and the entrance to the burial chamber. Walking westwards along the road, and on the roadside, is a late Neolithic burial chamber, also called and ‘entrance grave’. 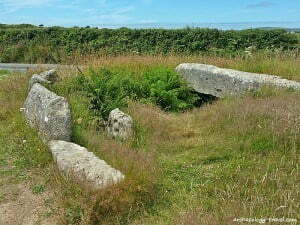 This type of burial chamber is common in Cornwall and the Scilly Isles. A narrow entrance passage, walled and roofed with stone slabs leads to a central, rectangular chamber. The chamber and the entrance passage would have been covered with earth and rubble to form a circular mound. Smaller stone slabs were then set against the edge of the mound to form a kerb. Many of these features can be observed despite the mound having been destroyed by the road. At Tregiffian about half of the mound survives today, which would have been about 15 metres in diameter. The inner dimensions of the stone-lined chamber measure 4.9 by 1.8 and just under a metre high. Four large slabs make up the roof of the chamber. A few remaining kerb stones form a noticeable arc (at the south-east end) as they were placed around the edge of the mound. The original in the Royal Cornwall Museum. Of particular interest at this burial mound is the decorated stone, which has about 25 cup marks carved into the surface. Decorated stone such as this one are associated with a number of other later Neolithic and early Bronze Age sites in the United Kingdom. The entrance to the chamber is restricted by two jambstones, and it is one of these jambstones that has the cup marks on it. The stone in place on site is a replica – the original was removed and is now housed in the Royal Cornwall Museum, Truro. There, the stone can be seen in the Cornish Gallery, where there is an excellent series of displays on Cornish history from prehistoric times to the present day. Excavation of this burial chamber by William Copeland Borlase in 1871 produced bones, ashes and flint, as well as several pits that contained human bones. More recent excavations of other entrance graves have also yielded cremated human remains and funerary urns. And the thought is that these were communal burial monuments. About 200 metres to the west of the circle is a single standing menhir – known as Goon Rith or the fiddler, and 300 metres to the north a pair of standing stones known as the pipers. At three metres high, the pipers are said to be the tallest still erect prehistoric menhirs in Cornwall. But why ‘Merry Maidens’, and what have they got to do with Sunday trading you ask? Throughout Europe Megalithic monuments like these are the subject of some quite fanciful folklore. 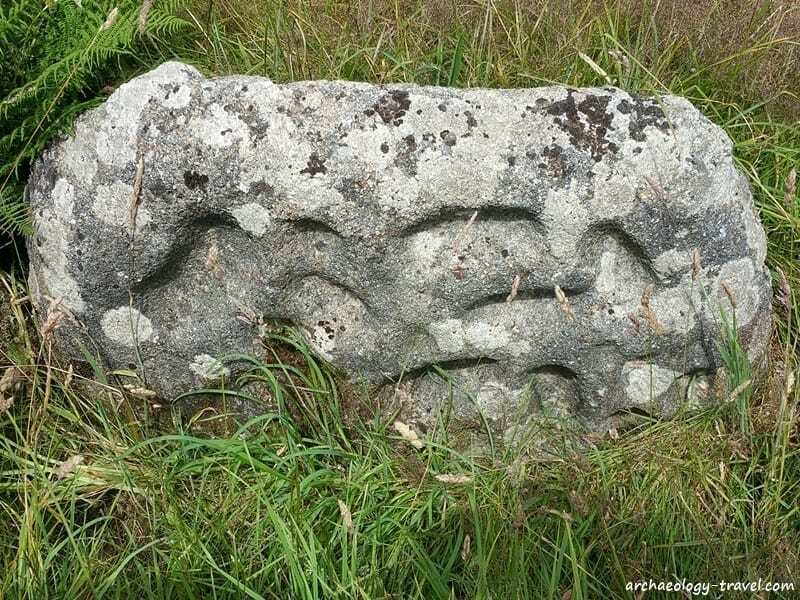 A few years ago I visited some of the megalithic monuments in north-eastern Brittany. Historic oral tradition in that area of France associates the megalithic sites with fairies. Folklore associated with stone circles in the west-country have a different take on their origins. According to a popular and widespread legend in the west of England, stone circles are the petrified remains of women having been turned to stone as punishment for dancing on a Sunday. They stand as a warning to others thinking about transgression. Here near Penzance, this particular group of women were turned to stone along with their musicians, a fiddler and two pipers. As with most oral traditions around the World, this one too is capable of adapting to specific, local detail. The reason why the fiddler and the pipers are some distance away from the spot where the maidens were dancing, it is said, is because the musicians heard the bells of the nearby church at St Buryan in the wind as they struck midnight. They realised that they were breaking religious rules and went running off up the hill leaving the maidens dancing. Not surprisingly, given such a moralistic nature of this legend, the cowards were caught in flight and turned to stone. Dancing on a Sunday indeed! Getting to the Merry Maidens stone circle is easy. This cluster of funerary and ritual monuments lies in farmland on the B3315, which runs from Newlyn to Land’s End. The public bus that runs from Penzance to Land’s End stops here, the stop is called Merry Maidens. And there is an ample car park with space for about 4 or 5 cars, or a bus. A public footpath running roughly east-west passes through the stone circle – the path can be seen on the Google map above. For those who enjoy walking, and are visiting Cornwall for some of the many stunning coastal walks, The Merry Maidens, the menhirs and Tregiffian Burial Chamber are included on two walks on the South West Coast Path website (an easy 3 mile/4.8 km walk: The Cove – Merry Maidens; and a challenging 6 mile/9.9 km The Merry Maidens Walk) and one of the Automobile Association’s website: Merry Maidens and the Way Down to Lamorna. Stonehenge this is not, and restored or not, this is an interesting prehistoric landscape that is definitely worth a visit. Merry Maidens: Bus stop and car park.